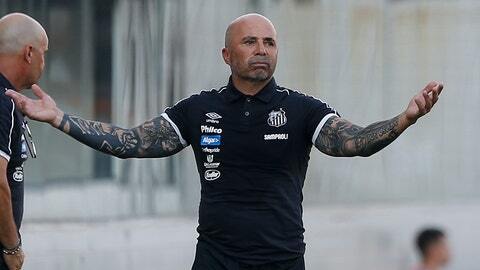 On Saturday, the 58-year-old marked his first official match in charge of Brazilian club Santos with a 1-0 victory. It was also his first game since Argentina’s defeat by France in the last 16 of the World Cup. Santos fans have huge expectations for their new coach because of his attacking DNA, an instinct they believe that naturally belongs at a club that has produced players like Pele, Robinho and Neymar. Argentine Sampaoli’s hero on his debut against little-known Ferroviaria in the Sao Paulo state championship was 25-year-old midfielder Jean Mota, who scored the winner in the 78th minute to rescue an uninspired performance by his side. Santos’ main asset, striker Bruno Henrique, is also expected to leave for Rio de Janeiro-based Flamengo even though the coach wants to keep him. According to media reports, Sampaoli calls chairman Jose Carlos Peres several times a day to talk about possible new signings and discuss what is needed for Santos to fight for titles again. Santos has not won the Copa Libertadores, South America’s equivalent to the European Champions League, since 2011, when Neymar was still in the team. Its last Brazilian championship crown came in 2004 when the side was led by Robinho. Sampaoli’s contract runs until the end of 2020.